The complex politics of global warming results from numerous cofactors arising from the global economy's interdependence on carbon dioxide emitting hydrocarbon energy sources and because carbon dioxide is directly implicated in global warming – making global warming a non-traditional environmental challenge. 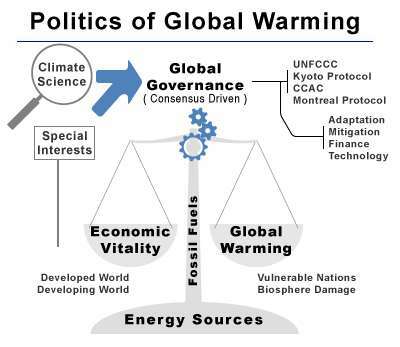 Politicization of climate science – Although there is a consensus on the science of global warming and its likely effects – some special interests groups work to suppress the consensus while others work to amplify the alarm of global warming. All parties that engage in such acts add to the politicization of the science of global warming. The result is a clouding of the reality of the global warming problem. Traditional environmental challenges generally involve behavior by a small group of industries who create products or services for a limited set of consumers in a manner that causes some form of damage to the environment which is clear. As an example, a gold mine might release a dangerous chemical byproduct into a waterway that kills the fish in the waterway: a clear environmental damage. By contrast, carbon dioxide is a naturally occurring colorless odorless trace gas that is essential to the biosphere. Carbon dioxide is produced by all animals and utilized by plants and algae to build their body structures. Plant structures buried for tens of millions of years sequester carbon to form coal, oil and gas which modern industrial societies find essential to economic vitality. Over 80% of the worlds energy is derived from carbon dioxide emitting fossil fuels and over 91% of the world's energy is derived from non carbon-neutral energy sources. Scientists attribute the increases of carbon dioxide in the atmosphere to industrial emissions and scientists have linked carbon dioxide to global warming. However, the scientific consensus is difficult for the average individual layperson to readily see and grasp. This essential nature to the world's economies combined with the complexity of the science and the interests of countless interested parties make climate change a non-traditional environmental challenge. Also, activities like cement production, deforestation, brick production, livestock raising, refrigeration and other industrial activity contributes greenhouse gases that together are believed to account for 1/3 of global warming. Because carbon dioxide emitting fossil fuels are intrinsically connected to a developed nation-state's economy, the taxation of fossil fuels or policies that decrease the availability of cost-effective fossil fuels is a significant political matter for fear that those taxes might precipitate a decrease in economic vitality. The replacement of cost-effective fossil fuels with more expensive renewable energy sources are seen by many as a hidden tax that would achieve the same result of depressing economic vitality and lead to impoverishment. 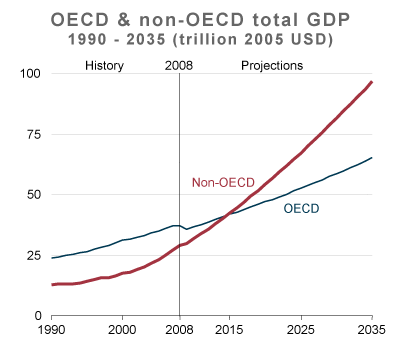 Beyond the economic vitality of a single nation, some are concerned that taxation would depress economic activity in a manner that could affect the geopolitical order by providing incentives to one set of countries over another. In developing countries the challenges are slightly different. Developing countries see carbon dioxide emitting fossil fuels as a cost effective and proven energy source to fuel their growing economies. Sometimes renewable energy technologies are not readily available to developing countries because of cost or due to export restrictions from developed countries who own those technologies. In 2010, renewable energy accounted for 16.7% of total energy consumption but Biomass energy which releases carbon dioxide and is not carbon-neutral accounted for 11.4%, leaving only 4.9% for carbon-neutral renewables (hydropower 3.3% and 1.56% for all others). Carbon dioxide emitting fossil fuels continue to be abundant and their prices are consequently low accounting in 2010 for over 80% of the world's energy needs. 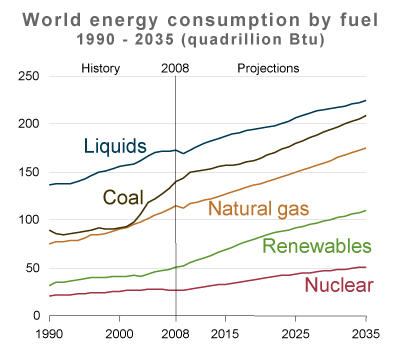 Advanced recovery technologies like horizontal drilling, offshore oil production, and oil sand recovery technologies continue to push back the threshold of Peak Oil and with it the high prices seen necessary to foster the development of viable alternative energy technologies that can replace fossil fuels in a post-hydrocarbon economy. Renewables in 2010 accounted for 16.7% of the world's energy, however Biomass energy accounted for 11.4% meaning that non-carbon dioxide producing renewables accounted for only 4.9% of the world's energy use with the vast majority of that renewable energy coming from hydroelectric production at 3.34% further leaving 1.56% of renewable energy derived from newer advanced technologies like ethanol, biodiesel, wind, solar, ocean power and geothermal (see graph to right). The biomass-is-carbon-neutral proposal put forward in the early 1990s has been superseded by more recent science that recognizes that mature, intact forests sequester carbon more effectively than cut-over areas. When a tree's carbon is released into the atmosphere in a single pulse, it contributes to climate change much more than woodland timber rotting slowly over decades. Current studies indicate that "even after 50 years the forest has not recovered to its initial carbon storage" and "the optimal strategy is likely to be protection of the standing forest". After adjustment, carbon neutral renewables account for 4.9% of the world's energy needs in 2010 with solar accounting for .23% and wind for 0.51% of total world energy need. 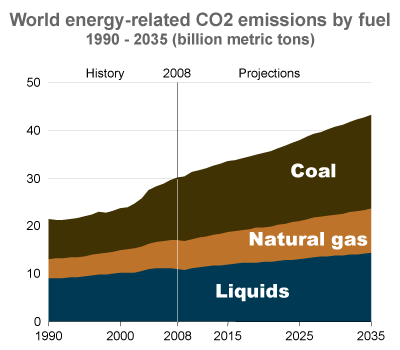 Recent optimistic projections from the EIA and the IEA show that renewables will account for one sixth of global energy production in the next few decades (which includes Biomass energy), substantially below what is needed to significantly curtail carbon dioxide emissions. Without help developing countries usually do not have access to the advanced energy technologies like wind and solar that they require for development forcing them to rely on hydrocarbon energy sources like fossil fuels and biomass. Without adequate and cost effective post-hydrocarbon energy sources, it is very unlikely the countries in developed or developing world would accept policies that would materially affect their economic vitality or economic development prospects. To date, developing countries have resisted adopting verifiable carbon dioxide targets for fear of impacts to their economies and the The United States, Russia, Canada, Japan, New Zealand, Belarus and Ukraine have either not ratified the Kyoto Protocol, withdrawn from the Kyoto Protocol or have chosen to not accept a second commitment period leaving the Kyoto Protocol extension covering only 15% of global carbon dioxide emissions. A strong contributor to these decisions is that the existing technologies are not yet adequate to replace the role of fossil hydrocarbon fuels. Arguments have been made that fostering renewable energy through subsidies and other adoption-mechanisms are the path towards increasing the percentage of carbon-neutral renewable technologies that are used. According to IEA (2011) energy subsidies artificially lower the price of energy paid by consumers, raise the price received by producers or lower the cost of production. "Fossil fuels subsidies costs generally outweigh the benefits. Subsidies to renewables and low-carbon energy technologies can bring long-term economic and environmental benefits". In November 2011, an IEA report entitled Deploying Renewables 2011 said "subsidies in green energy technologies that were not yet competitive are justified in order to give an incentive to investing into technologies with clear environmental and energy security benefits". The IEA's report disagreed with claims that renewable energy technologies are only viable through costly subsidies and not able to produce energy reliably to meet demand. "A portfolio of renewable energy technologies is becoming cost-competitive in an increasingly broad range of circumstances, in some cases providing investment opportunities without the need for specific economic support," the IEA said, and added that "cost reductions in critical technologies, such as wind and solar, are set to continue." By contrast, Fossil-fuel consumption subsidies were $409 billion in 2010, oil products ca half of it. Renewable-energy subsidies were $66 billion in 2010 and will reach according to IEA $250 billion by 2035. Renewable energy is subsidized in order to compete in the market, increase their volume and develop the technology so that the subsidies become unnecessary with the development. Eliminating fossil-fuel subsidies could bring economic and environmental benefits. Phasing out fossil-fuel subsidies by 2020 would cut primary energy demand 5%. Since the start of 2010, at least 15 countries have taken steps to phase out fossil-fuel subsidies. According to IEA onshore wind may become competitive around 2020 in the European Union. monies to adapt to climate change. There are significant disagreements over which metrics to use when tracking global warming and there are also disagreements over which countries should be subject to emissions restrictions. While the biosphere is indifferent to whether the greenhouse gases are produced by one country or by a multitude, the countries of the world do express an interest in such matters. As such disagreements arise on whether per capita emissions should be used or whether total emissions should be used as a metric for each individual country. Countries also disagree over whether a developing country should share the same commitment as a developed country that has been emitting carbon dioxide and other greenhouse gases for close to a century. Some developing countries expressly state that they require assistance if they are to develop, which is seen as a right, in a fashion that does not contribute carbon dioxide or other greenhouse gases to the atmosphere. Many times, these needs materialize as profound differences in global conferences by countries on the subject and the debates quickly turn to pecuniary matters. Most developing countries are unwilling to accept limits on their carbon dioxide and other greenhouse gas emissions while most developed countries place very modest limits on their willingness to assist developing countries. In addition, most developed countries would rather not participate in greenhouse gas reduction treaties if those would lead to decreased economic activity, transfers of wealth to developing countries, or significant shifts in the geopolitical balance of power of the world. Some developing countries fall under the category of vulnerable to climate change. These countries involve small, sometimes isolated, island nations, low lying nations, nations who rely on drinking water from shrinking glaciers etc. These vulnerable countries see themselves as the victims of climate change and some have organized themselves under groups like the Climate Vulnerable Forum. These countries seek mitigation monies from the developed and the industrializing countries to help them adapt to the impending catastrophes that they see climate change will bring upon them. For these countries climate change is seen as an existential threat and the politics of these countries is to seek reparation and adaptation monies from the developed world and some see it as their right. Adaptation – social and other changes that must be undertaken to successfully adapt to climate change. Adaptation might encompass, but is not limited to, changes in agriculture and urban planning. Finance – how countries will finance adaptation to and mitigation of climate change, whether from public or private sources or from wealth/technology transfers from developed countries to developing countries and the management mechanisms for those monies. Mitigation – steps and actions that the countries of the world can take to mitigate the effects of climate change. Technology – the technologies that are needed lower carbon emissions through increasing energy efficiency or replacement or carbon dioxide emitting technologies and technologies needed to adapt or mitigate climate change. Also encompasses ways that developed countries can support developing countries in adopting new technologies or increasing efficiency. Loss and damage – first articulated at the 2012 conference and in part based on the agreement that was signed at the 2010 United Nations Climate Change Conference in Cancun. It introduces the principle that countries vulnerable to the effects of climate change may be financially compensated in future by countries that fail to curb their carbon emissions. The primary mechanism for the world to tackle global warming is through a process established under the United Nations Framework Convention on Climate Change (UNFCCC) treaty. The current state of global warming politics is that there is frustration over a perceived lack of progress with the establish UNFCCC overall process which has progressed over eighteen years but which has been unable to curb global greenhouse gas emissions. Todd Stern – the US Climate Change envoy – has expressed the challenges with the UNFCCC process as follows, "Climate change is not a conventional environmental issue...It implicates virtually every aspect of a state's economy, so it makes countries nervous about growth and development. This is an economic issue every bit as it is an environmental one." He went on to explain that, the United Nations Framework Convention on Climate Change is a multilateral body concerned with climate change and can be an inefficient system for enacting international policy. Because the framework system includes over 190 countries and because negotiations are governed by consensus, small groups of countries can often block progress. The eighteenth conference of the parties held in Doha, Qatar, 2012 United Nations Climate Change Conference, yielded minor to modest restults. At the 2012 Doha climate change talks, Parties to the Kyoto Protocol agreed to an extension of the Kyoto Protocol to 2020. Participants in the extension to the Kyoto Protocol have taken on targets for the period 2013-2020, and include Australia, the European Union, and a number of other developed countries. Canada, who withdrew from the Kyoto Protocol in 2011, and The United States – who never ratified the Kyoto Protocol – have been joined by New Zealand, Japan, Russia, Belarus, and Ukraine who have stated that they would not sign up to a second Kyoto Protocol commitment period or extension due lack of commitments from the developing world which today include the world's largest carbon dioxide emitters. Japan and New Zealand also added that their country's CO2 emissions are minor when compared to the emissions of China, The United States, and the European Union. These defections place significant pressures on the UNFCCC process which to date has not been able to curtail carbon dioxide emissions, whose latest Kyoto Protocol extension only accounts for 15% of greenhouse gas emissions, and whose process is seen by some as slow, cumbersome, expensive and an inefficient use of taxpayer money: in the UK alone the climate change department has taken over 3,000 flights over the course of two years at a cost to the taxpayer of over ₤1,500,000. The outcome of the Doha talks has received a mixed response, with small island states critical of the overall package. Other results of the conference include a timetable for a global agreement to be adopted by 2015 which includes all countries. As a result, some have argued that perhaps the consensus driven model could be replaced with a majority vote model. However, that model would likely drive disagreement at the country-level-ratification by countries who disagreed with any global treaties that might passed through a majority vote at such restructured institutions. The perceived slow process of efforts for countries to agree to a comprehensive global level binding agreements has led some countries to seek independent/voluntary steps and focus on alternative high-value voluntary activities like the creation of the Climate and Clean Air Coalition to Reduce Short-Lived Climate Pollutants by the United States, Canada, Mexico, Bangladesh, and Sweden which seeks to regulate short-lived pollutants such as methane, black carbon and hydrofluorocarbons (HFCs) which together are believed to account for up to 1/3 of current global warming but whose regulation is not as fraught with wide economic impacts and opposition. The Climate and Clean Air Coalition to Reduce Short-Lived Climate Pollutants (CCAC) was launched on February 16, 2012 to regulate short-lived climate pollutants (SLCPs) that together contribute up to 1/3 of global warming. The coalition's creation is seen as a necessary and pragmatic step given the slow pace of global climate change agreements under the UNFCCC. As part of the 2010 Cancún agreements, 76 developed and developing countries have made voluntary pledges to control their emissions of greenhouse gases. These voluntary steps are seen by some as a new model where countries pledge to voluntarily take action against global warming outside of international treaties or obligations to other parties. This voluntary mechanism, while promising, does not address many of the challenges seen by the developing world in their efforts to mitigate global warming, adapt to global warming, and increasingly to deal with losses and damages that they directly attribute to global warming that they blame on the developed world's historical emissions. Financial Institutions – Financial institutions generally support restrictive policies regarding global warming, particularly the implementation of carbon trading schemes and the creation of market mechanisms that associate a price with carbon. These new markets would require trading infrastructures which banking institutions are well positioned to provide. Financial institutions would also be positioned well to invest, trade and develop various financial instruments that they could profit from through speculative positions on carbon prices and the use of brokerage and other financial functions like insurance and derivative instruments. Environmental groups – Environmental groups generally take ideological positions on global warming and favor strict restrictions on carbon dioxide emissions. Environmental groups, as activists, engage in raising awareness and attracting investment into the advocacy movement to further raise awareness. Fossil fuel companies – Traditional fossil fuel corporations could benefit or lose from stricter global warming regulations. A reduction in the use of fossil fuels could negatively impact fossil fuel corporations. However, the fact that fossil fuel companies are a large source of energy, are also the primary source of carbon dioxide, and are engaged in energy trading might mean that their participation in trading schemes and other such mechanisms might give them a unique advantage and makes it unclear whether traditional fossil fuel companies would all and always be against stricter global warming policies. As an example, Enron, a traditional gas pipeline company with a large trading desk heavily lobbied the government for the EPA to regulate CO2: they thought that they would dominate the energy industry if they could be at the center of energy trading. Alternative energy companies – alternative energy companies like wind and solar generally support stricter global warming policies. They would expect their share of the energy market to expand as fossil fuels are made more expensive through trading schemes or taxes. Nuclear energy companies – nuclear energy companies could see a renaissance in a world where fossil fuels are taxed directly or through a carbon trading mechanism. For this reason, it is likely that nuclear energy companies would likely support stricter global warming policies. Traditional retailers and marketers – traditional retailers, marketers, and the general corporations respond by adopting policies that resonate with their customers. If "being green" helps a general corporation, then they could undertake modest programs to please and better align with their customers. However, since the general corporation does not make a profit from their particular position, it is unlikely that they would strongly lobby either for or against a stricter global warming policy position. Governments – On the Australian Sunday morning political discussion show The Bolt Report, Richard Lindzen said in a 2011 interview that governments might use global warming as a rationale for additional taxes. The various interested parties sometimes align with one another to reinforce their message. Sometimes industries will fund specialty nonprofit organizations to raise awareness and lobby on their behest. The combinations and tactics that the various interested parties use are nuanced and sometimes unlimited in the variety of their approaches to promote their positions onto the general public. In the scientific literature, there is a strong consensus that global surface temperatures have increased in recent decades and that the trend is caused primarily by human-induced emissions of greenhouse gases. With regard to the global warming controversy, the scientific mainstream puts neither doubt on the existence of global warming nor on its causes and effects. The politicization of science in the sense of a manipulation of science for political gains is a part of the political process. It is part of the controversies about intelligent design (compare the Wedge strategy) or Merchants of Doubt, scientists that are under suspicion to willingly obscure findings. e.g. about issues like tobacco smoke, ozone depletion, global warming or acid rain. However, e.g. in case of the Ozone depletion, global regulation based on the Montreal Protocol has been successful, in a climate of high uncertainty and against strong resistance while in case of Climate Change, the Kyoto Protocol failed. While the IPCC process tries to find and orchestrate the findings of global (climate) change research to shape a worldwide consensus on the matter it has been itself been object of a strong politicization. Anthropogenic climate change evolved from a mere science issue to a top global policy topic. The IPCC process faces currently a paradox lockstep where having built a broad science consensus does not hinder governments to follow different, if not opposing goals. In case of the ozone depletion challenge, there was global regulation already being installed before a scientific consensus was established. A linear model of policy-making, based on a more knowledge we have, the better the political response will be does therefore not apply. Knowledge policy, successfully managing knowledge and uncertainties as base of political decision making requires a better understanding of the relation between science, public (lack of) understanding and policy instead. Michael Oppenheimer confirms limitations of the IPCC consensus approach and asks for concurring, smaller assessments of special problems instead of large scale attempts as in the previous IPCC assessment reports. He claims that governments require a broader exploration of uncertainties in the future. Historically, the politics of climate change dates back to several conferences in the late 1960s and the early 1970s under NATO and President Richard Nixon. 1979 saw the world's first World Climate Conference. 1985 was the year that the Vienna Convention for the Protection of the Ozone Layer was created and two years later in 1987 saw the signing of the Montreal Protocol under the Vienna convention. This model of using a Framework conference followed by Protocols under the Framework was seen as a promising governing structure that could be used as a path towards a functional governance approach that could be used to tackle broad global multi-nation/state challenges like global warming. One year later in 1988 the Intergovernmental Panel on Climate Change was created by the World Meteorological Organization and the United Nations Environment Programme to assess the risk of human-induced climate change. Margaret Thatcher 1988 strongly supported IPCC and 1990 was instrumental to found the Hadley Centre for Climate Prediction and Research in Exeter. 1991 saw the publishing of the book The First Global Revolution by the Club of Rome report which sought to connect environment, water availability, food production, energy production, materials, population growth and other elements into a blueprint for the twenty-first century: political thinking was evolving to look at the world in terms of an integrated global system not just in terms of weather and climate but in terms of energy needs, food, population, etc. 1992 was the year that the United Nations Framework Convention on Climate Change (UNFCCC) was agreed at the Earth Summit in Rio de Janeiro and the framework entered into force 21 March 1994. The conference established a yearly meeting, a conference of the parties or COP meeting to be held to continue work on Protocols which would be enforceable treaties. 1995 saw the creation of the phrase preventing dangerous anthropogenic interference with the climate system (also called avoiding dangerous climate change) first appeared in a policy document of a governmental organization, the IPCC's Second Assessment Report: Climate Change 1995. and in 1996 the European Union adopt a goal of limiting temperature rises to a maximum 2 °C rise in average global temperature. 1997 saw the creation of the Kyoto Protocol under the United Nations Framework Convention on Climate Change (UNFCCC) in a very similar structure as the Montreal Protocol was under the Vienna Convention for the Protection of the Ozone Layer which would have yearly meetings of the members or CMP meetings. However, in the same year, the US Senate passed Byrd–Hagel Resolution rejecting Kyoto without more commitments from developing countries. Since the 1992 UNFCCC treaty, eighteen COP sessions and eight CMP sessions have been held under the existing structure. In that time, global CO2 emissions have risen significantly and developing countries have grown significantly with China replacing the United States as the largest emitter of greenhouse gases. To some, the UNFCCC has made significant progress in helping the world become aware of the perils of global warming and has moved the world forward in the addressing of the challenge. To others, the UNFCCC process has been a failure due to its inability to control the rise of greenhouse gas emissions. A number of proposals for a Global Climate Regime are currently discussed, as the Durban Platform for Enhanced Action calls for a comprehensive new agreement in 2015 that includes both Annex-I and Non-Annex-I parties. 1969, on Initiative of US President Richard Nixon, NATO tried to establish a third civil column and planned to establish itself as a hub of research and initiatives in the civil region, especially on environmental topics. 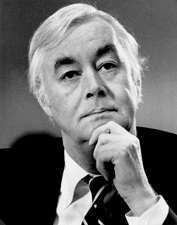 Daniel Patrick Moynihan, Nixons NATO delegate for the topic named acid rain and the greenhouse effect as suitable international challenges to be dealt by NATO. NATO had suitable expertise in the field, experience with international research coordination and a direct access to governments. After an enthusiastic start on authority level, the German government reacted skeptically. The initiative was seen as an American attempt to regain international terrain after the lost Vietnam War. The topics and the internal coordination and preparation effort however gained momentum in civil conferences and institutions in Germany and beyond during the Brandt government. 1987: Montreal Protocol on restricting ozone layer-damaging CFCs demonstrates the possibility of coordinated international action on global environmental issues. 1988: Intergovernmental Panel on Climate Change set up to coordinate scientific research, by two United Nations organizations, the World Meteorological Organization and the United Nations Environment Programme (UNEP) to assess the "risk of human-induced climate change". 1992: United Nations Framework Convention on Climate Change was formed to "prevent dangerous anthropogenic interference with the climate system"
November/December 2005: United Nations Climate Change Conference; the first meeting of the Parties of the Kyoto Protocol, alongside the 11th Conference of the Parties (COP11), to plan further measures for 2008–2012 and beyond. 30 October 2006: The Stern Review is published. It is the first comprehensive contribution to the global warming debate by an economist and its conclusions lead to the promise of urgent action by the UK government to further curb Europe's CO2 emissions and engage other countries to do so. It discusses the consequences of climate change, mitigation measures to prevent it, possible adaptation measures to deal with its consequences, and prospects for international cooperation. 26 June 2009: US House of Representatives passes the American Clean Energy and Security Act, the "first time either house of Congress had approved a bill meant to curb the heat-trapping gases scientists have linked to climate change." 12 December 2015: World leaders meet in Paris, France for the 21st Conference of the Parties of the UNFCCC. 187 countries eventually signed on to the Paris Agreement. As of September 2016, 187 UNFCCC members have signed the treaty, 60 of which have ratified it. The agreement will only enter into force provided that 55 countries that produce at least 55% of the world's greenhouse gas emissions ratify, accept, approve or accede to the agreement; although the minimum number of ratifications has been reached, the ratifying states do not produce the requisite percentage of greenhouse gases for the agreement to enter into force. ↑ The Editorial Board (28 November 2015). "What the Paris Climate Meeting Must Do". New York Times. Retrieved 28 November 2015. ↑ Rudd, Kevin (25 May 2015). "Paris Can't Be Another Copenhagen". New York Times. Retrieved 26 May 2015. ↑ Gillis, Justin (28 November 2015). "Short Answers to Hard Questions About Climate Change". New York Times. Retrieved 29 November 2015. 1 2 ""Voices" speaker talks climate change". The Dartmouth. Retrieved 29 November 2012. 1 2 3 Mary S. Booth. "Biomass Briefing, October 2009" (PDF). massenvironmentalenergy.org. Massachusetts Environmental Energy Alliance. Retrieved 12 December 2010. ↑ "Arsenic poisoning stalks India's gold mines". SciDev. ↑ "Renewables 2012 Global Status Report" (PDF). REN21. Renewables Energy Policy Network for the 21st Century. Archived from the original (PDF) on 15 December 2012. Retrieved 12 December 2012. ↑ Henning Gloystein (Nov 23, 2011). "Renewable energy becoming cost competitive, IEA says". Reuters. ↑ Vidal, John (3 December 2012). "Climate change compensation emerges as major issue at Doha talks". London: The Guardian. Retrieved 3 December 2012. 1 2 3 Ritter, K. and M. Casey. "UN conference adopts extension of Kyoto accord". CTPost. Retrieved 8 December 2012. 1 2 UNFCCC. Conference of the Parties serving as the meeting of the Parties to the Kyoto Protocol (CMP) (8 December 2012), Outcome of the work of the Ad Hoc Working Group on Further Commitments for Annex I Parties under the Kyoto Protocol. Draft decision proposed by the President (EN). Notes: Agenda item 4: Report of the Ad Hoc Working Group on Further Commitments for Annex I Parties under the Kyoto Protocol. Meeting: Conference of the Parties serving as the meeting of the Parties to the Kyoto Protocol (CMP), Eighth session, 26 November – 7 December 2012, Doha, Qatar. FCCC/KP/CMP/2012/L.9 (PDF), Geneva, Switzerland: United Nations Office , pp.6-7. Other languages available. ↑ McCarthy, Michael (2 December 2010). "Japan derails climate talks by refusing to renew Kyoto treaty". London: The Independent. Retrieved 29 November 2012. ↑ "UK climate change department takes over 3000 flights at a cost of over £1.3m". The Commenator. Retrieved 29 November 2012. ↑ UN Climate Change Secretariat (8 December 2012), Doha climate conference opens gateway to greater ambition and action on climate change (press release) (PDF), Bonn, Germany: UN Climate Change Secretariat , p.2. ↑ "Secretary Clinton To Announce a Climate and Clean Air Initiative To Reduce Short-Lived Climate Pollutants". US Dept of State. Retrieved 29 November 2012. ↑ King, D.; et al. (July 2011), "Copenhagen and Cancun", International climate change negotiations: Key lessons and next steps, Oxford, UK: Smith School of Enterprise and the Environment, University of Oxford, p. 12, doi:10.4210/ssee.pbs.2011.0003, archived from the original on 1 August 2013 PDF version is also available Archived 13 January 2012 at the Wayback Machine. ↑ "Banking on carbon trading: Can banks stop climate change?". CNN. 20 July 2008. Retrieved 22 February 2013. ↑ "The climate lobby from soup to nuts". Center for Public Integrity. Retrieved 23 February 2013. ↑ David Michaels (2008) Doubt is Their Product: How Industry's Assault on Science Threatens Your Health. ↑ Hoggan, James; Littlemore, Richard (2009). Climate Cover-Up: The Crusade to Deny Global Warming. Vancouver: Greystone Books. ISBN 978-1-55365-485-8. Retrieved 2010-03-19. See, e.g., p31 ff, describing industry-based advocacy strategies in the context of climate change denial, and p73 ff, describing involvement of free-market think tanks in climate-change denial. ↑ "Enron Sought Global Warming Regulation, Not Free Markets". Competitive Enterprise Institute. Retrieved 4 December 2012. ↑ "Under Obama, Spain's Solar, Wind Energy Companies Invest Big In US". Huffington Post. 18 January 2013. Retrieved 22 February 2013. ↑ "The Pro-Nukes Environmental Movement". Slate Institute. Retrieved 22 February 2013. ↑ "25 Big Companies That Are Going Green". Business Pundit. Retrieved 22 February 2013. ↑ "26 Interview with Richard Lindzen". Bolt. Retrieved 3 May 2013. ↑ "Climate change lobbying dominated by 10 firms". Politico. Retrieved 23 February 2013. ↑ "Greenpeace informal alliance with Wind and Solar". Retrieved 23 February 2013. ↑ Oreskes, Naomi (December 2004). "BEYOND THE IVORY TOWER: The Scientific Consensus on Climate Change". Science. 306 (5702): 1686. doi:10.1126/science.1103618. PMID 15576594. Such statements suggest that there might be substantive disagreement in the scientific community about the reality of anthropogenic climate change. This is not the case. [...] Politicians, economists, journalists, and others may have the impression of confusion, disagreement, or discord among climate scientists, but that impression is incorrect. ↑ America's Climate Choices: Panel on Advancing the Science of Climate Change; National Research Council (2010). Advancing the Science of Climate Change. Washington, D.C.: The National Academies Press. ISBN 0-309-14588-0. (p1) ... there is a strong, credible body of evidence, based on multiple lines of research, documenting that climate is changing and that these changes are in large part caused by human activities. While much remains to be learned, the core phenomenon, scientific questions, and hypotheses have been examined thoroughly and have stood firm in the face of serious scientific debate and careful evaluation of alternative explanations. * * * (p21-22) Some scientific conclusions or theories have been so thoroughly examined and tested, and supported by so many independent observations and results, that their likelihood of subsequently being found to be wrong is vanishingly small. Such conclusions and theories are then regarded as settled facts. This is the case for the conclusions that the Earth system is warming and that much of this warming is very likely due to human activities. ↑ "Understanding and Responding to Climate Change" (PDF). United States National Academy of Sciences. 2008. Retrieved 30 May 2010. Most scientists agree that the warming in recent decades has been caused primarily by human activities that have increased the amount of greenhouse gases in the atmosphere. ↑ American Association for the Advancement of Science Statement on the Teaching of Evolution Archived 21 February 2006 at the Wayback Machine. ↑ Boykoff, M.T. ; Boykoff, J.M. (2004). "Balance as bias: Global warming and the US prestige press". Global Environmental Change (14): 125–136. ↑ Aant Elzinga, "Shaping Worldwide Consensus: the Orchestration of Global Change Research", in Elzinga & Landström eds. (1996): 223-255. ISBN 0-947568-67-0. 1 2 "Byrd-Hagel Resolution (S. Res. 98) Expressing the Sense of the Senate Regarding Conditions for the US Signing the Global Climate Change Treaty". Nationalcenter.org. Retrieved 2010-08-29. ↑ "The First World Climate Conference". Archived from the original on September 28, 2007. ↑ Broder, John (2009-06-26). "House Passes Bill to Address Threat of Climate Change". New York Times. Retrieved 2009-06-27. New York Times, 10 March 2005, "Evangelicals Put Climate Change High on Their Agenda: Evangelical Leaders Swing Influence Behind Effort to Combat Global Warming"
James Hansen (2009). Storms of My Grandchildren: The Truth About the Coming Climate Catastrophe and Our Last Chance to Save Humanity, Bloomsbury Press, New York, ISBN 978-1-60819-200-7. Naomi Oreskes and Erik M. Conway (2010). Merchants of Doubt: How a Handful of Scientists Obscured the Truth on Issues from Tobacco Smoke to Global Warming, Bloomsbury Press, New York. Eric Pooley (2010). The Climate War: True Believers, Power Brokers, and the Fight to Save the Planet, Hyperion, New York, ISBN 978-1-4013-2326-4. George Monbiot, The Guardian, 12 July 2005, "Faced with this crisis: Instead of denying climate change is happening, the US now denies that we need proper regulation to stop it"
George Monbiot, The Guardian, 20 September 2005, "It would seem that I was wrong about big business: Corporations are ready to act on global warming but are thwarted by ministers who resist regulation in the name of the market"
John D. Sterman and Linda Booth Sweeney (undated) "Understanding Public Complacency About Climate Change: Adults' mental models of climate change violate conservation of matter"
Amanda Griscom Little, Grist Magazine, 20 July 2005, "The Revolution Will Be Localized"